Artist's illustration of astronauts on the Martian surface. A successful crewed Mars campaign must recognize, and take pains to ameliorate, the psychological and cultural challenges that Red Planet pioneers will face, a prominent space architect says. 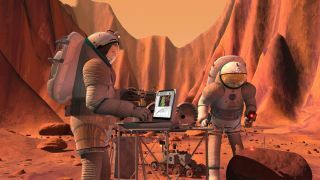 For example, a manned mission to Mars must take into account sojourning astronauts' lengthy isolation from friends and family, said Marc Cohen, of the California-based company Astrotecture. "Long-duration missions to Mars and beyond cannot succeed if human support and human system integration strategy is based on denial and avoidance of the crew issues that are as real as [issues like] burning all the propellant," Cohen added. Cohen listed some of the challenges that would make a Mars trip difficult for astronauts, from the obvious (constant confinement; separation from family for a long period of time) to the more obscure (no separation of work and social life; the relative lack of fresh fruits and vegetables; disconnection from the natural world). "What would it be like to lose contact entirely with the environment of the natural world in which humans evolved — no seasons, no swimming, no long walks in the woods?" Cohen said. Kelly has said that he misses fresh air, friends and family. "We can see that the sense of confinement is starting to wear on him, and the things that go along with it," Cohen said. Cohen advocates employing a "bioregenerative" life-support system that incorporates plants and/or microbes to generate fresh air and grow food, creating a sort of ecosystem aboard a spacecraft or habitat. Indeed, such a system should be the starting point for a Mars-bound crewed vessel, he said. "You need to basically develop this life-support system that performs all of the bioregenerative functions, and then design the spacecraft around it," Cohen said. Trying to shoehorn a bioregenerative system into a predetermined volume "absolutely will not work," he added. "Those physical constraints will just be prohibitive." Cohen didn't offer many other specific solutions to help address the human needs of Mars astronauts. But he said those specifics need to be worked out; mission planners can't just cram Red Planet crewmembers into a bare-bones tin can and expect them to endure the ensuing privations with equanimity. "I'm raising the questions; I'm not sure what we would actually need," Cohen said. "What I am arguing is that you can't start out saying, 'Nah, we don't need any of that stuff.' I think there needs to be sincere, open, honest and inclusive research to look at: What will the crew really need to sustain them, and how will we compensate for all the things that they'll be missing when they go?"